Airbus’ first A320NEO, MSN 6101 (A320-271N) has entered the final assembly line (FAL) at Toulouse, marking yet another milestone in the A320NEO program. The forward fuselage, which arrived from St. Nazaire in France, and the aft fuselage, which arrived from Hamburg in Germany, were mated at the FAL, marking the start of the final assembly. The next stage is the joining of the wing to the fuselage. 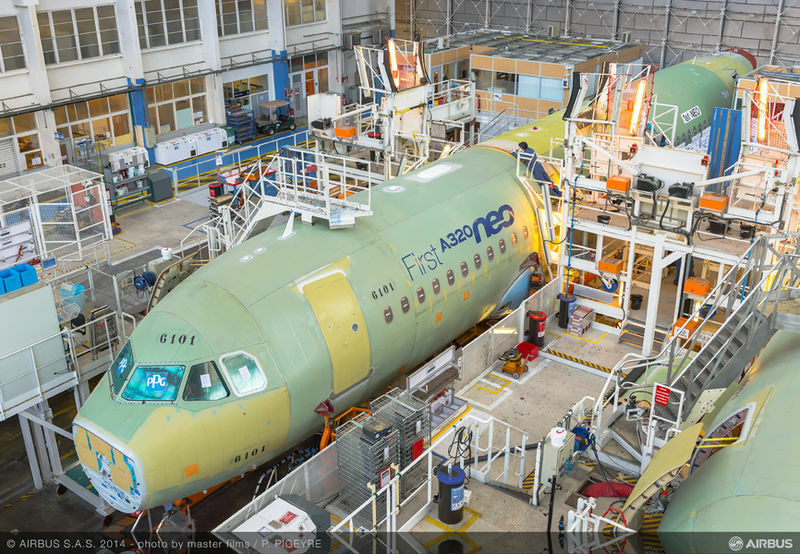 Overall, it takes about one month to complete the final assembly of an A320 Family aircraft. The A320 program crossed a major milestone in November 2013, when the assembly of the first major component- the engine pylon- took place. First flight is expected in the Autumn of 2014, almost 4 years after the program was launched in December 2010. Airbus took the landmark decision of re-engining the A320 Family after sensing imminent competition from Bombardier’s C-Series airplanes. Airbus will retain 95% airframe commonality with the present A320, offering the benefit of high dispatch reliability associated with a mature airframe. Airbus has also effected incremental changes to its traditional Airbus A320, thereby eliminating the risks associated with too many modifications in one shot. In the November of 2011, Airbus flew the first A320 with the version of the sharklets that are now seen on all new production Airbus A320 airplanes, first sharklet-equipped A320 being MSN 5428 delivered in December 2012. The sharklets, which will feature on the A320NEO as well, introduce fuel savings of upto 4% on long flights. Preliminary wing strengthening to handle the aerodynamic loads introduced by the sharklets, and airplane-wide weight reduction to offset the weight due to the strengthening have already been effected. NEO’s difference from today’s in-production A320 aircraft is the further strengthening of the wing and fuselage to handle the loads associated with the heavier and larger New Engine Option (NEO): The Pratt and Whitney PW1100G and the CFM LEAP-1A. The new more efficient engine together with the sharklets realize a 15% fuel savings on 800nm route lengths, and up to 16%+ on the longer routes, compared to non-sharklet fitted Airbus A320 aircraft. The Pratt and Whitney Geared Turbofan Engine PW1100G series for the A320, took to the skies in May 2013, on a Pratt and Whitney Boeing 747SP flying test bed. Changes to the A320 are minimal and the least among other airplanes which are being re-engined and modified to a larger extent, such as the Boeing 737MAX and the Embraer Second Generation E-Jets E2. Historically, all new airplane programs have been met with significant dispatch reliability issues related to technical or maintenance issues associated with an immature airframe. The A320NEO program has the least changes, followed by the MAX and E2 program. The all-new Bombardier C-Series introduces many firsts for Bombardier, making it the program that may likely have the most number of issues, initially atleast: a reason which explains the low number of firm orders: 201, despite having 3 flying airplanes in the test campaign. In contrast, the Embraer E-Jet E2 program, which airplanes are still “paper” (conceptual), has 200 firm orders. The Boeing 737MAX has 1,807 firm orders and the Airbus A320NEO program has firm orders for 2,667 airplanes. Least changes with benefits where it matters to an already proven and mature airframe, incremental modifications, early introduction into service (Q4 2015), a dual engine source (all other new/re-engine programs have only one engine supplier), keeping up program development schedule, and the smallest training impact have contributed in large to the sales success of the program. IndiGo has an order for 180 Airbus A320NEO Family aircraft, which include the A320NEO and A321 NEO. Go Air has 72 airplanes on order, and Air Asia 264 A320NEOs on order. Both IndiGo and GoAir’s A320NEOs will be powered by the Pratt & Whitney PW1100G. IndiGo operates the IAE engines, of which Pratt and Whitney is a part. Go Air which flies CFM powered A320 aircraft, has switched engine suppliers, to Pratt and Whitney. The PW1100G engines offer two advantages: Room for growth, and availability sooner than the CFM LEAP-1A Engines. Air Asia, which flies CFM powered A320s, has opted for the CFM LEAP-1A to power its NEOs.